Advanced communication technologies along with the rise of internet connected devices and BYOD is disrupting the telecom industry. With a requirement to connect over billions of devices, telecommunications service providers are turning their focus towards multi-device and multi-network services. Further, consumers today have adapted to network connectivity with speed. The expansion of mobile ecosystem, and simultaneously the demand for high-bandwidth services like video and gaming is causing tremendous pressure on the telecommunication industry to increase the quality and speed of connectivity. Furthermore, advanced networking technologies are turning the world into a connected digital ecosystem where digitization has become the crux of workforce organizations. With more organizations rapidly implementing new communication methodologies in their business operations, it has become prerogative for the telecom companies to perform conscientiously well in this arena to keep up with the growing pace. For telecom companies, success will depend on acquiring greater knowledge and understanding of coherent digital ecosystems along with making sure the digital ecosystems are efficient. Apropos to these scenarios and trends in the Telecommunication landscape, CIOReview’s expert panel evaluated the solutions and capacities of ‘20 Most Promising Telecommunication Solutions Providers’. The companies featured here provide a look into how their solutions work in the real world and assess the right solutions to shape up against market competition and industry challenges. In our selection process, we looked at the vendor’s capability to fulfill the need for cost-effective and flexible solutions that add value to the Telecommunication landscape. 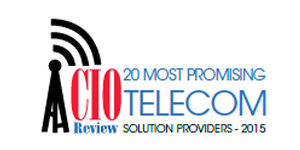 We present to you CIO Review 20 Most Promising Telecommunications Solution Providers 2015. NetCracker NetCracker is the leading provider of BSS/OSS solutions to communications service providers around the world. RadiusPoint Provider of expense management tool for telecom services and invoices. Sigma Software Provides real-time convergent and unified billing,M2M/IoT device management and bigdata analytics, Enterprise Product Catalogs (EPC) along with Policy Control and Charging Management solutions for telecom service providers. TeleDynamicX A provider of Telecommunications BSS/OSS and Big Data solutions that help monitize networks and customers. TransNexus Provides software solutions for fraud management, dynamic least cost routing, quality of service routing, direct peering, traffic analysis, and billing to major VoIP carriers worldwide. UpNetworx IT business advisor and provider of network, voice, data, and cloud solutions.